This was stage one of my two year plan which started in September 2011 when I finished racing Ironman & found that the World Championships were being held in London in September 2013, so this race was the first qualifyer for the Olympic distance race. This will be the first time I have put myself in the firing line in a high quality field of athletes in my age group (973 athletes with 124 in my age group). We travelled up on Friday which took us about 5 hours to get to Chester. Saturday consisted on trying to find our way around the city, which was not easy to start with, then we headed off sussing out the locations for registration, transition, parking etc before recci-ing the bike course. When we got back to our B&B I then did a gentle 20min bike to make sure everything was OK followed by a 10min run to loosen everything up. Race day arrived with a sensible start time of 8:30am. 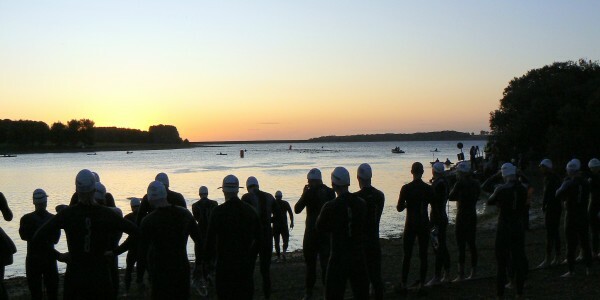 The swim was a one lap river swim which yet again was cold at 12-14 degrees. I took a good 5mins to acclimatise to the temperature. The swim was OK. I managed to keep out of trouble all the way round. It seemed to go quite well, but the time says differently. The only problem was when I tried to get out of the river onto the exit ramp, my right hamstring locked up so I just had to take a few seconds for it to release. I then headed up to transition, which was up a 400mtr steep incline, which included steps, to get to T1. Out onto the one lap bike course now, which consisted on one good quality hill, many undulations, crap road surfaces & several big pot-holes. However, I coped with it reasonably well but I did get overtaken by a few demon bikers in my age group. Other than that, & apart from cold feet which I really did notice when I entered T2, everything seemed to go to plan. When I did get my timing slip after the race & found that I came 33rd in my age group, I felt a little bit deflated, but it was my first time racing against these boys & it does show what class there is in my age group & what a lot of work I have got to do to qualify for London, because all 32 in front of me have put their names down for London, which has a total of 97 registered for this distance. Hopefully, my next race will be a bit warmer.